One nice thing about the recent Pearl Jam tours is that they always take a day off between a two-night stand at the same venue. So for die-hard traveling fans who want to see both shows, we are forced to spend a whole day off in a new and exciting locale. I have mentioned before that we had passed through Seattle on two previous occasions, but we had not spent any significant time there. So for our bonus day we planned our very own "Grunge Tour" where we would visit some of the early haunts of the Seattle music scene. We slept in after the previous night's festivities, and then began our day in Jet City by meeting a friend and fellow road-dog for lunch at Salumi, a New York style sandwich shop in downtown Seattle. Heather and I split a super-tasty roast pork sandwich, plenty for both of us and fuel for the long day ahead. We then headed to Easy Street Records in West Seattle for photos at their iconic "Mother Love Bone" wall, which has been featured in movies and as album cover art. The store itself is a record-lover's dream, with an impressive selection of titles at great prices. There is also a cafe and a bar on site. I found lots of albums that I would have otherwise purchased, but we still had a week and a half of the road ahead and I didn't want to try to protect vinyl in the car the whole time, so in the end I just window-shopped...and had a few beers. From there we drove into the Capitol Hill neighborhood for a geek pilgrimage to the apartment building featured in the Cameron Crowe film "Singles," a romantic comedy set against the backdrop of the city's Grunge Scene heyday. We snapped a few photos and then gave our friend a ride back to where he was staying and continued on our own. We drove to Lakeview Cemetery next to visit the gravesites of Bruce and Brandon Lee. Bruce obviously being a huge hero to their community, there were car and vans full of Asian tourists coming and going while we were there. One mother was explaining to her children who he was, and I wish I had been able to record what she was saying. I shared a moment with them and said he was poetry in motion, and she agreed. 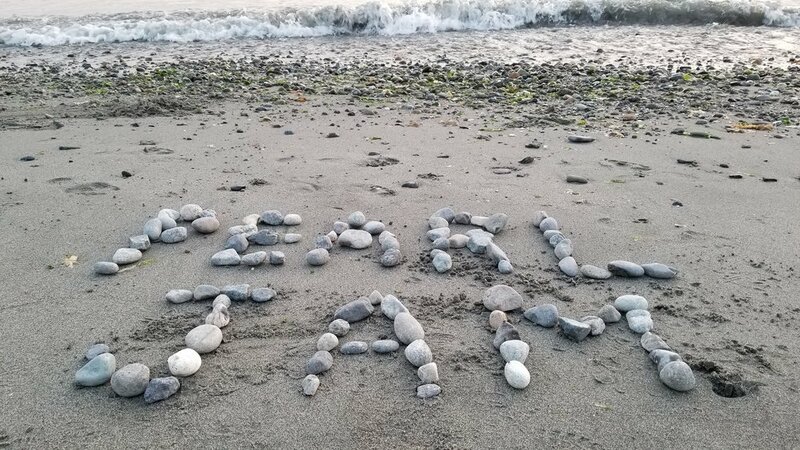 We then drove through the suburb of Bellevue, home of the band Queensryche, and ended our day at Golden Gardens Park on the shore of Puget Sound, hanging on the beach with all the locals and watching the sun set over The Olympic Mountains on the opposite shore. The next day we slept in and started the day with a swim in the motel pool and a soak in the hot tub. We drove into the city and found a parking spot in a much nicer area of town, only having to feed the meter for two hours until it was free. 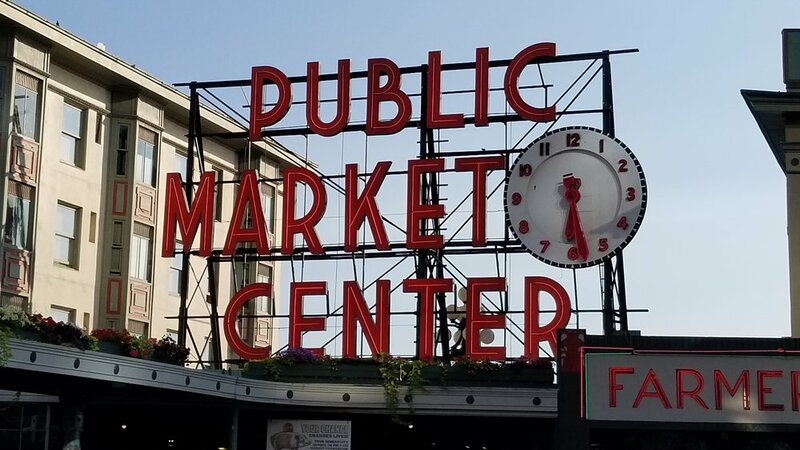 We were parked equidistant from the stadium in one direction, and the historic Pike Street Public Market, a Seattle institution in the other. We headed towards the market, but it was an uphill walk the entire way. We eventually grew tired, conveniently right in front of The Seattle Beer Company, so we stopped in to refresh ourselves with a sample of local suds. After that we were fueled for the rest of the trip up the hill, and we made a quick tour of the market district before starting the two-mile hike to the stadium. We ended up catching a ride in a bicycle-powered rickshaw for the second mile, and it was a fun breezy cruise directly to the stadium entrance. We had reserved seats for this show, so we were able to stroll around the ballpark for awhile before showtime. I didn't know how they were going to top Wednesday's epic show, but I should have known for a Friday night hometown show that Pearl Jam would pull out all the stops. And that they did. 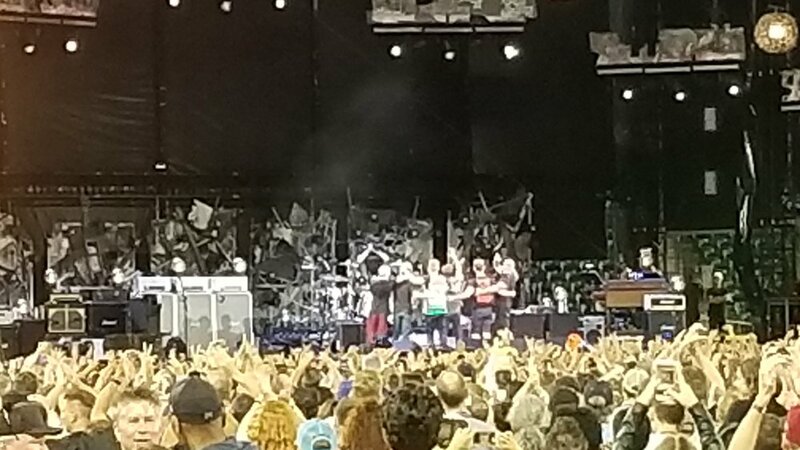 From the 36-song setlist, to the moving Tom Petty tribute at the start of Encore One, to the guests that sat in (Mark Arm and Steve Turner of Mudhoney, and Kim Thayil of Soundgarden), this show may well have been the greatest Pearl Jam show I have seen yet. It was a fine way to cap off our Triduum in the Grunge Capital of the world. A quick word about that label, "Grunge." I always found it odd that so many disparate sounding bands were lumped into one genre. Pearl Jam does not sound like Nirvana, who do not sound like Alice In Chains, who sound nothing like Soundgarden. After spending three days in Seattle I came to realize that the label is pretty much a descriptor of the city, not the sound. It's a beautiful cosmopolitan place in many ways, and it has its issues like homelessness and poverty, but there is certainly a noticable "crust" to the city. It's a well lived-in place that is more than appropriately described with the G-word. And you know, that's not a bad thing..